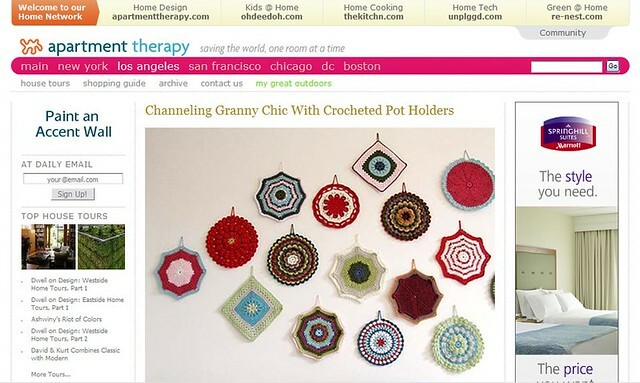 Just a quickie to let you know about a wee bit of wednesday afternoon reading "channelling granny chic with crocheted pot holders". hello.....some of them don't pull any punches do they? or never heard of the saying "if you can't say anything nice, don't say anything at all"
oh well.....i think it's a lovely feature, they look so cute! Never mind Emma, I quite liked them when I read your original post. There's always going to be "haters" out there once you're publicly exposed. It happens to all of us. And may I add that I have often used the term "granny chic" myself. Ha, ha, they are such a bunch of design snobs. Remember unless you sprinkle the words Eames or Thonet through your conversation they just don't want to know! These are gorgeous! I have sent the link to all my sisters (we all have a collection of potholders from our Nana). I came over from that original post on AT. Glad they featured you! How rude people can be! If something's not to your taste, surely you just surf on by until you find something else which is? Oh, to have that much waste-able time! The comments are too funny! What a lot of whingeing design-nerds! I like the last comment I saw, that that site is the wrong audience for your (gorgeous) craft. Here, here. I am guessing that none of them came to your blog to see the pieces in context?! It looks fantastic...I would love to have a collection as impressive as yours...great work!!! Congrats on the wee feature Emma. Well deserved... these look amazing!! I'm a bit shocked by the granny attack over at AT. Always best to get people talking though I reckon. I love them and good on your for getting featured. Congratulations Emma! They are so lovely and totally unique! Now Spanner can go and brag to his mates about his super talented and famous mistress! being a buyer of your lovely crocheted wares i feel most qualified in saying those commentators really don't have a 'clue' what they are talking about... your crocheted potholders and cushions are breathtakingly beautiful and your images are a 'delight' for the eyes.